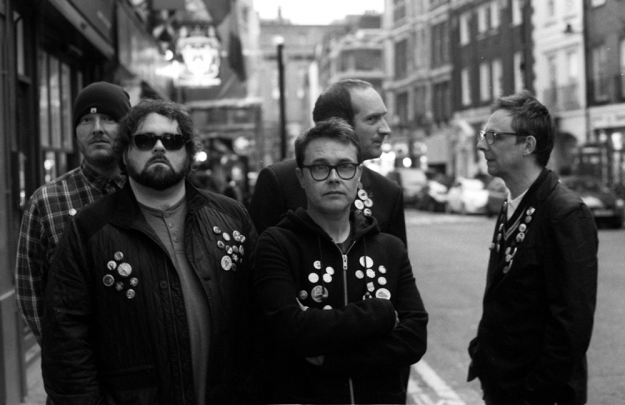 The election result may not have been what they wanted but agitating supergroup THEE CEE CEES’ belt and braces approach to rock’n’politics saw them release their debut single and album during the same week. Thee Cee Cees aka THEE CONCERNED CITIZENS feature an all-star line-up of DIY music maven and Xtra Mile signing Chris T-T, Bluetones guitarist Adam Devlin, Thee Faction’s Billy Brentford, Paul Weller bassist Andy Lewis and drummer Steve ‘Smiley’ Barnard of Joe Strummer’s Mescaleros and The Alarm. Their debut album Solution Songs, recorded under the radar at the BBC’s Maida Vale Studios, is available through Blang Records. Their debut single ‘Have An Analysis’, which was launched last week with a special show at Wilko Johnson’s local The Railway Hotel in Southend-on-Sea, is available as a limited edition 7-inch from Podrophenia Records. Check out the video here.